Last Friday I talked about the importance of creating policies and procedures. In that post, I talked about the value of having a written equipment check list to go through before ever shoot. There’s another list that’s pretty important if you’re a filmmaker: the shot list. This is the process I learned in filmmaking classes almost twenty years ago, and they still work great today. Click image for lager version. Oh, and please excuse the sloppy handwriting. You’ll notice that there are lines that overlap one another for the same scene. That’s because of “coverage.” Coverage is getting all the shots you need from all the important angels (e.g. wide, medium, close-up, over the shoulder, etc.) To the left of the page I’ve written short descriptions of each shot. As you can see, lining the script makes it very easy to see at a glance if you have all the necessary coverage. 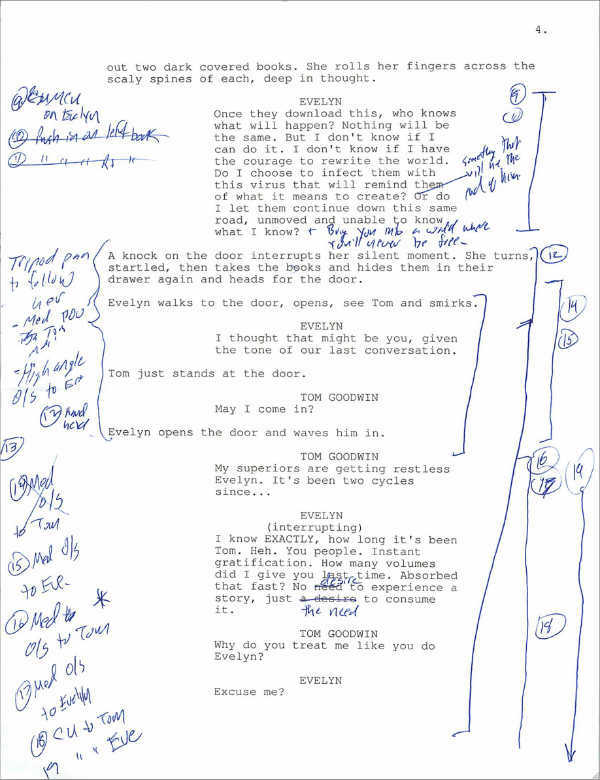 If a particular part of the scene only has one line down the side, that might suggest you don’t have enough coverage for that particular part of the scene. The columns should all be pretty self-explanatory: date, scene, shot, take, etc. The one column that may not necessarily be that obvious is the “Audio” column. This is where I marked the corresponding audio file from the Zoom H4N to make it easy in the editing room to find the correct audio clip. The last three digits are the corresponding file name from the Zoom. The first part of the file name is the date (e.g. 110612-001, which is the year 2011 on June 12). That is why we have a date column as well, to combine with the audio code to know exactly which file it was (e.g. 110611-001 vs. 110612-001). The rows highlighted in yellow are our “good” takes. The grey columns are shots we originally planned but cut out. You’ll also notice at the top of the audio column the code “MOS.” This is film jargon that stands for no sound during that take. Creating a shot list can be time-consuming, but is very important to ensure you get all the necessary shots. It should also be obvious that you don’t have to use a form like this just for scripted projects. If you’re shooting a wedding or other form of documentary, this can be just as useful. You just won’t have a corresponding lined script. Get started making your shot list today. I’ve added it to my Google docs template gallery at bit.ly/ronstemplates. It’s FREE! Note: we’re working on an in-depth behind the scenes project coming out later. Stay tuned. YES!!! I’ve been waiting for this one! Thanks for blogging this one Ron. Template downloaded already! Very cool, Ron. 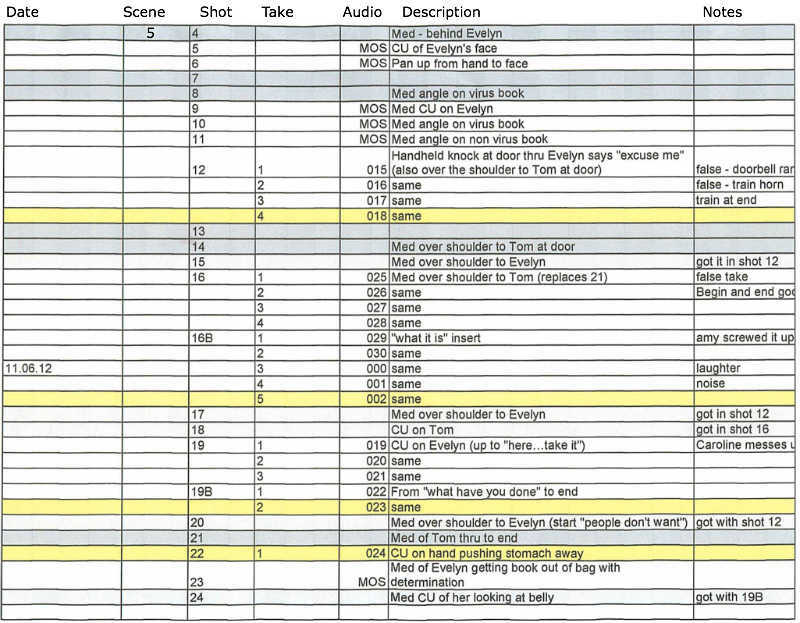 It’s usually the Script Supervisor that would be taking all these notes during the shoot.